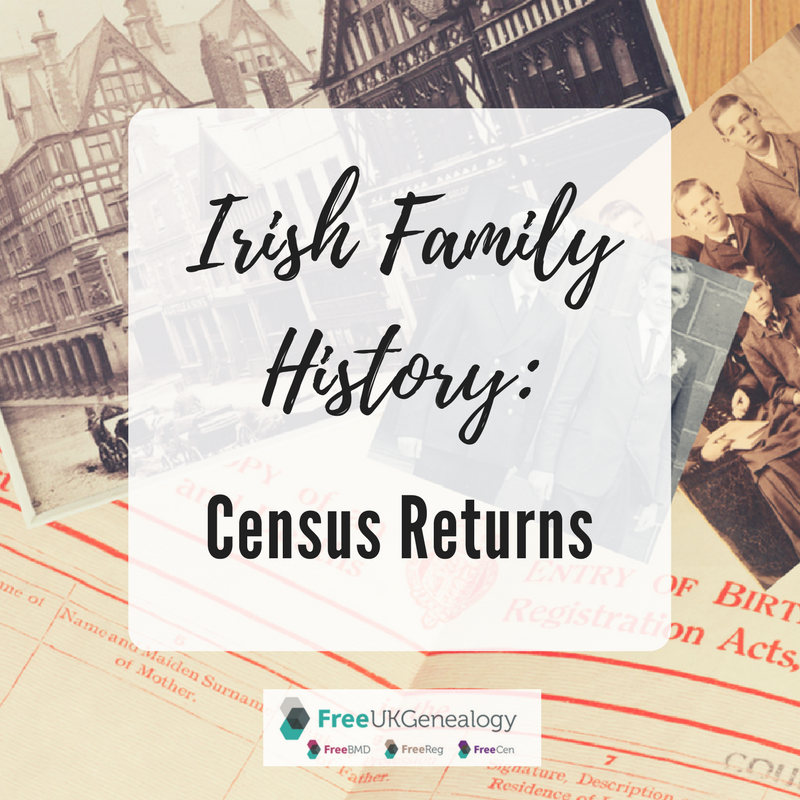 In the fourth post out of six on Researching Your Irish Family History, Nicola Morris explores the surviving Irish census returns, where to find them online and how to get the best out of the records. Have I already mentioned the destruction of the 19th century Irish census returns? This loss appears to be the basis for the erroneous belief that Irish genealogy is impossible. Population censuses as we understand them today began in Ireland in 1821 and continued every decade until 1911. Unfortunately, the census returns from 1861 to 1891 were destroyed during the First World War, possibly because of a paper shortage. In the 1922 Public Records Office fire the returns from 1821 to 1851 were also largely destroyed. Only fragments of these early census returns survive. This means that the only complete surviving census returns for Ireland are for 1901 and 1911. However, as good genealogical miners, Irish genealogists know how to squeeze every last drop of information out of what survives. Do you know the name of the person you are searching for? Try to establish all of the different variants under which their name might be recorded. For example, Catherine Byrne could appear in the census as Kate, Katie, Kathleen or Katherine and Byrne might be recorded as Beirne, Burns or Byrnes. The search engine for the Irish census returns on the National Archives site requires an exact spelling and will not show variants of names. For this reason I will often search using wildcards. By searching for K*t* or C*t* B*rn* I should be able to see all possible variants of that name. Don’t underestimate the ability of your ancestors to use unusual spellings for first names. The census was transcribed exactly as it appears on the original return. In some small cases, the head of household put the family surname in the first name field and the first names in the surname field. This means that the only way to find some families is to search for Byrne Catherine, rather than Catherine Byrne. Inmates of workhouses, prisons and institutions as well as police constables in barracks, only appear in the census under their initials. If Catherine Byrne was in the workhouse on the night of the census, she would appear as C. or K. B. While you may find several entries for a C.B. in workhouse and institutional returns, other identifying information recorded on the census should help you to narrow down the field of your search. For example, are you looking for a C.B. who was a female, unmarried, age about 27, who was born in Carlow or a 68 year old widower who was born in Dublin? If Catherine had infant children with her in the workhouse, they may appear in the same return. Infants stayed with their mother, so should be enumerated just under her entry. You might confirm the correct return if you find C.B. with a male infant J.B. (James Byrne). It should be noted that policemen who were in the barracks on the night of the census and who were recorded by their initials only, listed their occupation not as constable, but the occupation they held at the time of their recruitment. 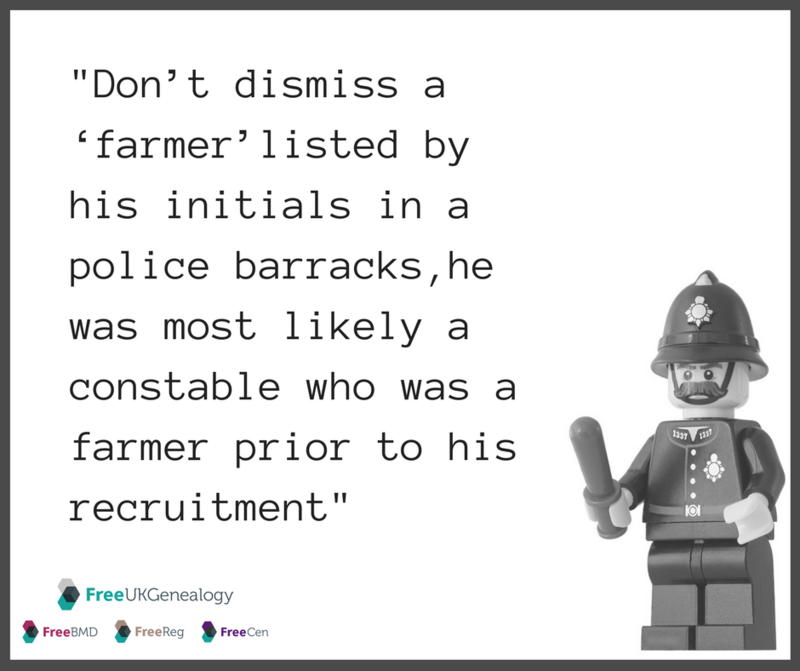 Don’t dismiss a ‘farmer’ listed by his initials in a police barracks, he was most likely a constable who was a farmer prior to his recruitment. Bear in mind that ages given on census returns were not always accurate. As ages given in other sources may not be accurate either, it is always sensible to keep your search broad to start with. For example, the age recorded on a death certificate, particularly for someone who has died in advanced old age, may not be correct. The age was usually given by the informant and not the deceased and may be incorrect. The true age of the deceased individual may not have been known by their spouse or children. Ages given on the actual census return were usually given by the head of household, who may not have known his wife’s true age and thus given an incorrect age on the return. A man with a wife who was older than him, may have reduced her age to bring in into line with or below his own. The introduction of the old age pension between the 1901 and 1911 census encouraged older household members to advance their age to bring them closer to qualifying for the pension. The reason behind this is that when the pension was introduced, older members of the population born prior to 1864 when civil registration was introduced, could not provide a birth certificate as proof of age. Instead, they could request a search of the earlier census returns that would confirm their age in 1841 or 1851, thus meeting the age qualification for the pension. While age is an important factor in identifying the correct census returns for your ancestor, do not rely on your ancestor giving the correct age on their census return. Do you know your ancestor’s occupation? Occupations were usually recorded on birth, marriage and death certificates. If your ancestor was a cabinet maker, teacher or nurse, you can use the ‘advance search’ section to search for all Byrnes who were teachers. However, it is important to bear in mind how that occupation might have been described. A teacher may have been described as a N.S. Teacher (National School Teacher) or a policeman may have been described as a policeman, constable or RIC. In some cases a person’s occupation may have changed, even between the 1901 and 1911 census, a labourer in one instance, may have gained employment as a cooper by the time of the next census. Usually, anyone who is described as a pensioner has retired from service with the constabulary, army or navy. Do you know your ancestor’s religion? The 1901 and 1911 census of Ireland recorded the religious denomination of the population. You might be looking for a Byrne family who were Church of Ireland rather than Roman Catholic and searching by religious denomination can help to narrow the field. If you are unsure of the religion of your ancestors, the census can be used to determine the religion of families with the same name. For example, searching for a particular surname in Co. Fermanagh might reveal that in nearly all instances persons with that name were Roman Catholic, when the assumption was that they were Church of Ireland. Determining the religious denomination of your ancestors in Ireland using the census will allow you to focus your research on specific church records. Do you know when your ancestor was born and the age they might have been at the time of the census? The search engine on the National Archives of Ireland website will list all entries with an age range five years either side of the age given in the search form. It is possible, once the results have been listed, to click on ‘Age’ and have the results listed in descending order from the youngest to the oldest, making it easier to focus on a specific age range. I have already mentioned that Irish genealogists mine the census for every scrap of available information. When searching the census online, do not just make a note of the name, age and religion of the individuals, which is what you will see in your initial results. Click on the box: ‘show all information’. This will reveal the birthplace, occupation, literacy, marital status and language of the inhabitants as well as their relationship with the head of the household. The 1911 census also recorded the length of time a couple had been married, the number of children born to their marriage and the number of children alive in 1911. The 1911 census return for Catherine Byrne at Baldonnell revealed that she was born in Dublin city ca. 1866. The presence of her brother, Peter Beatty, establishes her maiden name. She had been married for 25 years, indicating that she married ca. 1886 and she had given birth to 4 children, all of whom were living in 1911 but only three were living at home. It is now possible to search for the marriage of a Catherine Beatty to a Patrick Byrne, farmer, ca. 1886, most likely in a Roman Catholic parish in Dublin city, where Catherine was born. Below the transcribed information for each family, you will see links to ‘view census images’. Always view the original household return to make sure that the transcribed information is correct. In many instances it is not. The other images associated with the census can also be mined for information, particularly the House and Building Return (Form B1). This return will give you a description of the house your family occupied. The return will tell you how many rooms they occupied in the house, the materials from which the house was built and how many windows were at the front of the building as well as the number of out buildings or farm buildings on the property (which are described in more detail on the Out-Offices and Farm-Steadings Return Form B2). The House and Building Return will also give you a picture of all the households in a townland or on the same street and on occasion identify the landlord of the property. It is not uncommon, when inspecting the House and Building Return, to notice a cluster of families with the same surname listed one after the other. Are these families all related? Are they brothers or cousins who built their own houses on a single family plot? Is the widow living next door the mother of your ancestor, in her own house, on the same family plot? If you know the address of your ancestor you can get an overview of the entire townland by browsing rather than searching the census. However, in order to browse you will need to know the District Electoral Division (DED) in which your townland is located. A shortcut to identifying the DED and the returns for a specific townland can be found on John Grenham’s website www.johngrenham.com. Search the Places section for your townland. When identified, and you open the page for the parish in which that townland is located, click on the 1901 or 1911 link. You will be brought to the census website, to the page relating to the DED in which your townland is located. You can then click on your townland and see the surnames of each household in the townland with a link to each household return. This route is helpful when you have failed to find your family even when you know their address. I have often looked at all of the occupiers of a townland and discovered that the family I was searching for were incorrectly recorded as O’Rogan, when I had been searching for Regans. The 1901 and 1911 census of Ireland are springboards for most family history researchers. Finding your family in the census should tell you where and when they were born, when they married, the number of children of their marriage, their occupation, ability to read and write and religion, as well as the type of house they lived in and whether their neighbours might have been siblings or cousins. All of this information is freely available at http://www.census.nationalarchives.ie/. On the same site you will also have the option to search the fragments that survive from the 1821, 1831, 1841 and 1851 census. Browsing this record set will demonstrate how little actually survives, but if you have family from Cavan you may find surviving 1821 returns, which can be searched by parish and townland as well as by surname. One other remnant of the 19th century census returns that have been published online by the National Archives of Ireland are the census search forms. These are the forms used by applicants for the old age pension requesting a search of the 1841 and 1851 census for evidence of age. The forms include the name and current address of the applicant and usually their parents’ names and the name of the townland they were residing in at the time of the 1841 or 1851 census. Notes on the form can include the names and ages of other siblings of the applicant. These forms can be searched at http://censussearchforms.nationalarchives.ie/search/cs/home.jsp. The most important thing to remember when searching both of these sites is that the spelling of surnames, first names and townlands is as they appear on the original return or as they have been interpreted by the transcriber. If you cannot find what you are looking for try using wild cards or browsing the census instead. Only a very small number of returns are actually missing from the online collection. The best way to determine whether a return is missing is to compare the townland returns for the 1901 and 1911 census. For example, a street in Clonmel recorded 27 houses in 1911, but the same street in 1901 does not appear. This return is missing but the microfilm copies can still be consulted in the National Archives of Ireland and it is still possible to make a case to view the originals if you can demonstrate their absence from the microfilm and online collections. Both Findmypast.ie and Ancestry.co.uk have indexed the 1901 and 1911 census of Ireland. The most useful search tool that these sites have to offer is that you can search for more than one member of a particular household. This is helpful if you are looking for someone with a common name, but also know the name of their parents, spouse or children. The 1901 and 1911 census of Ireland returns are effectively the only census returns that we have. They are a treasure trove of information and the starting point for researching your family back into the 19th century. The penultimate instalment due next week, will explore the records that act as substitutes for the missing censuses. 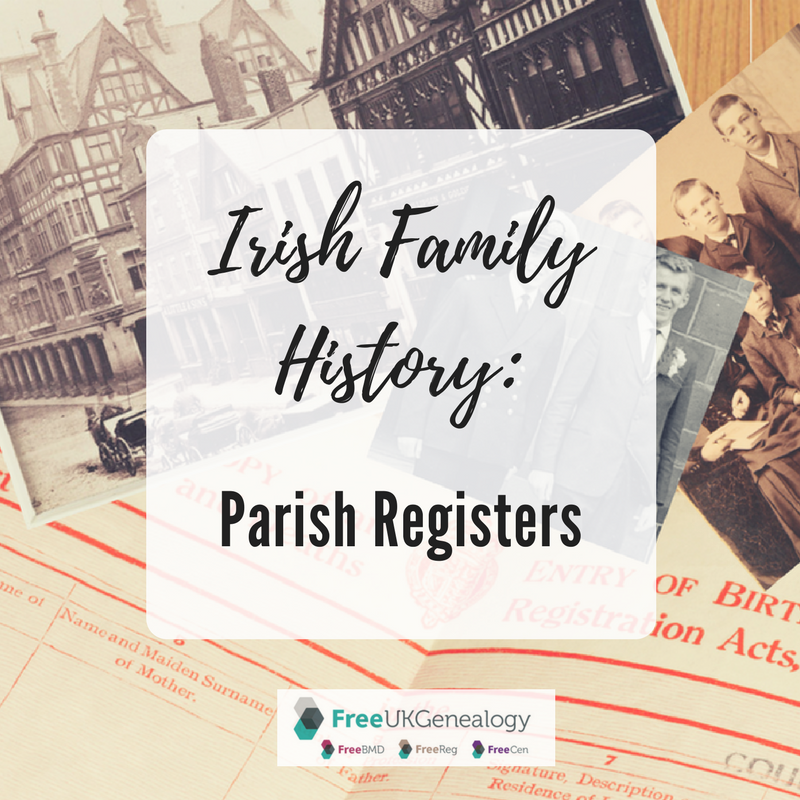 In the third instalment on Researching Your Irish Family History, Nicola Morris explains how to research your Irish ancestors through the useful resource of parish registers. Much like records for Irish civil registration, Irish parish registers can be found in a number of different locations online. Before signing up to a website to search for your ancestor in Irish parish registers it is important to make sure you are looking in the right place. In the first instance it is necessary to establish the religious denomination of the family you are searching for. The majority of the Irish population were Roman Catholic, but there were also Church of Ireland, Presbyterian, Methodist, Baptist, Moravian and Jewish congregations in Ireland. It should also be noted that with intermarriage some families changed religion during the course of the 19th or early 20th century. The 1901 and 1911 census of Ireland recorded the religion of the population. Even if your ancestor was not residing in Ireland at the time of the census, a look at the returns for families with the same surname in the same county may help to determine whether they were generally Roman Catholic or of another faith. The denomination of the church in which your ancestor married should also be recorded on their civil marriage certificate and it is worth checking this source for a clue to their religious denomination. However, some Irish emigrants may have arrived in England as Roman Catholic but married in the Church of England and brought their children up in their spouse’s faith. Roman Catholic parish registers are the property of the church and were kept by the individual parishes. This means that there was no wholesale destruction of these records. The survival of parish registers varies from parish to parish. The majority of Catholic parishes in Ireland have records that survive from the 1830s. In some cases there are registers that date from the mid-18th century and other parishes, particularly those on the north western seaboard, only have records that date from the 1850s, 1860s or later. Large Roman Catholic parishes were often made up of several chapels. The records for the various chapels were combined to create the register for the parish. However, some early surviving records are only the registers for one chapel and do not represent the entire parish. It is always helpful to try and identify the parish where your ancestors were born to determine the extent of the records that survive. If the records no longer survive for the period when your ancestor was born, it may not be worth paying for access to a database of records to search for your ancestor’s baptism. Every Roman Catholic parish maintained its own registers. In order to preserve a resource that documented the Roman Catholic population of Ireland from the mid-18th century, Dr. Edward MacLysaght, Chief Herald of Ireland, approached the Bishop of Limerick offering the National Library of Ireland’s services to help preserve these records. The Catholic hierarchy agreed to his proposal and from the early 1950s almost the entire surviving collection of Roman Catholic parish registers were microfilmed by the National Library of Ireland. The agreed cut off for microfilming was 1880, 16 years after the start of civil registration in Ireland, as it was felt that the entire population would be recorded in civil records by this time, even though this was not the case. These microfilms have been digitised by the National Library of Ireland and are freely available on their website (https://registers.nli.ie/). You can view this collection and manually search the images for baptismal, marriage and in some cases, burial entries. The National Library have not indexed the registers, so you cannot search for specific entries by name, but it is very easy to navigate a register to a specific event (baptism or marriage) and date and check the register yourself. This collection of microfilms has been indexed by Ancestry.co.uk and Findmypast.ie. On Ancestry this collection is “Ireland, Catholic Parish Registers, 1655-1915”. On Findmypast you just need to select “Parish Baptisms” under the “Life Events” category. Ancestry and Findmypast collaborated to index these parish registers once they were published by the National Library. Both databases have the same errors and omissions and their publication has been criticised for large numbers of inaccuracies, particularly the incorrect transcription of names, so do be cautious when searching these records. The absence of your ancestor from these records does not necessarily mean that there is no baptismal or marriage record for them and you may have to resort to a manual search of the images of the original registers. The records on both of these sites are generally limited to the 1880 cut off point set by the Catholic hierarchy when the registers were released for microfilming. There are a small number of parishes whose records were microfilmed much later, who released registers that go up to 1900 or 1915, but this is not true for the majority of records. In the 1980s a heritage centre was established in each county in Ireland to transcribe and index parish registers. The transcription was often undertaken locally using the original registers (not the microfilm copies from the National Library). In some cases additional registers had been found that were not microfilmed in the 1950s and 1960s. These were indexed by the county heritage centres, which means that their collection of records differ slightly to those in the National Library collection. For example, the registers for the Roman Catholic parish of Blessington in Co. Wicklow date from 1852 in the National Library of Ireland collection. However, an additional earlier register was found in the 1990s in either a book shop or a skip in Dublin and returned to the parish. This additional register, dating from 1821, was indexed by the Wicklow Heritage Centre. If your ancestor was baptised in this parish in 1827, they will not appear in the National Library collection or at Ancestry or Findmypast, but will appear on www.rootsireland.ie. Nearly all of the county heritage centre databases have been published online at www.rootsireland.ie. This is a subscription or pay-per-view website that also includes records of civil registration, Griffith’s Valuation, census returns and some burial records and gravestone inscriptions. The collections vary from county to county, so it is best to investigate their “Online Sources” for the county you are interested in before making a large investment in this site. Counties Clare, Wexford and parts of Tipperary, among some others, are very poorly represented on this site, while other counties such as Mayo, Galway and Derry have very extensive collections. What makes www.rootsireland.ie such a good resource is the flexibility of the search engine. If you choose to search the records for a specific county, it is possible to search for all births and baptisms for a child with the surname Murphy with a mother named Anne Ryan or even all children, irrespective of surname, born to a mother named Anne Ryan. You can also search for all children born to a mother named Anne Ryan at a specific townland address. It is even possible to search for all baptisms in a particular parish where the first godparent is named Murphy. Godparents were often siblings or cousins of the parents, so identifying Godparents on baptismal records can help to build a wider family profile. There are plenty of errors on this site as well. I frequently find baptismal records for a number of children in one family, but on inspection of the original registers find additional children that are missing from the online database. The quality of the transcription varies from county to county, so always be cautious and don’t assume that all records have been correctly transcribed. You can manually search the original register at the National Library of Ireland website to make sure nothing has been missed. There is another set of Roman Catholic parish registers available online at www.irishgenealogy.ie the free Irish government website for genealogy. This collection comes largely from the county heritage centres and are records that are not found on www.rootsireland.ie. They include the registers for Dublin City, Kerry and parts of Cork and are free to search. This site has a very straight forward search engine and will list all instances of a particular name, whether the person was recorded in the register as a child, parent or Godparent. Some, but not all, of the entries are linked to the original registers. Unlike records for civil registration, parish registers did not always follow the same format, particularly in the earlier 19th century. This means that you need to be prepared for unusual spellings and an unclear layout. Most registers will record the date, the name of the child, the names of the parents and the sponsors (Godparents). The register is written in Latin and first names were Latinised. At www.rootsireland.ie the Latin first names have been anglicised. On Ancestry and Findmypast they have remained in the original form. This means that Mary will appear as Maria and William as Guilliumus or James as Jacobus. Surnames remain unchanged in the Latin registers, but it is not uncommon to find the first names of parents incorrectly recorded by the parish priest, particularly the name of the mother. I have found ten children born to John Reilly and Anne Murphy, with a further two born to John Reilly and Rose Murphy in the same parish. The address recorded with the baptism confirms it is the same family, despite the fact that the mother’s first name was incorrectly entered by the priest. If I had used a search engine to find the children born to John and Anne, I would have missed two of the baptismal entries. When searching the records on RootsIreland I try to keep the search broad and then narrow it down. The search engine will identify a wide variant spelling of surnames, which is helpful but requires the exact spelling of the first name. This can be difficult if you are searching for a child named Ann, as you will need to search for Ann, Anne, Annie, etc. However, you can search for all entries beginning with ‘An’ or just ‘A’, which should reveal all variants. When using the address as part of your search, the wild card is ‘%’ and I use plenty of wild cards as the spelling of townland addresses in parish registers was not standardised. So Philipton, may appear as Phillipson, Philipstown, Phillipton. It should also be noted that local place names may have been used instead of the standard townland name assigned by the Ordnance Survey of Ireland in the 1830s. In Roman Catholic parish registers the mother’s maiden name was usually recorded. However, different parishes used different formats. Some registers might give the family name with the child and the mother’s maiden name with the parents. You might find the baptism of James Burke to William and Mary Connors. This means that James was the son of William Burke and Mary Connors. Alternatively, you may find an entry that reads James to William and Mary Burke, with the mother’s maiden name missing from the register. It can be difficult to determine the format used by the parish priest when searching online indexes. If you locate a baptismal or marriage entry, use the National Library of Ireland collection of parish registers to identify the original entry to confirm the accuracy of the record you have found. Most entries on the various sites, Ancestry, Findmypast and RootsIreland will link to an image of the original register. Viewing the original register is also important to make sure that there is no additional information missing from the online index. The parish priest occasionally recorded notes in the margin of the register that relate to the individual. If the parishioner married, details of their marriage might be written over or beside their baptismal entry. This can include overseas marriages. I have found baptismal records for a set of children that recorded marriages for four of the family in Boston written over their baptismal entry. When searching for Roman Catholic ancestors born or married in Ireland prior to civil registration there are a number of websites where you can search, each with its own errors and omissions. Before you start your search you can get a feel for what survives and where it is published online at John Grenham’s website www.johngrenham.com. There is a small subscription, which is very much worth the investment because of his detailed guides to parish registers and other genealogical sources. Roman Catholic parishes have different boundaries to civil parishes. If you can establish an address for your ancestor and identify the civil parish in which they were living, you will need to translate this into a Roman Catholic parish. This is easily done on John Grenham’s site. You may find that there were three Roman Catholic parishes that served the civil parish of your ancestors. John will link to where these records have been indexed online and the extent of the records on each site. You will also find a listing of the records for other denominations that correspond with your civil parish of choice. The majority of Church of Ireland parish registers were destroyed by fire in 1922. The Representative Church Body Library in Churchtown, Dublin is the repository for all surviving Church of Ireland records for the Republic of Ireland and they have produced a listing detailing all registers, those that were lost, what survives and where it can be found (https://www.ireland.anglican.org/cmsfiles/pdf/AboutUs/library/registers/ParishRegisters/PARISHREGISTERS.pdf). Microfilm copies for some of these parishes can also be found in the National Archives of Ireland and this is recorded on the list. Church of Ireland parishes in what is today Northern Ireland and from some of the counties on the border with Northern Ireland, can be found in the Public Records Office of Northern Ireland (PRONI), who have also published an excellent guide to their parish record collection (https://www.nidirect.gov.uk/sites/default/files/publications/Guide_to_church_records.pdf) John Grenham should indicate which of these records have been published online by the county heritage centres. Very little of the surviving Church of Ireland collection has been published online by Findmypast or Ancestry. In some cases it will be necessary to visit PRONI or the Representative Church Body Library in person to search their records if they have not been indexed online. The same is also true of the records for Presbyterian congregations. Largely found in Northern Ireland the majority of records are available through PRONI or the Presbyterian Historical Society (http://www.presbyterianhistoryireland.com/our-services/family-history/) in Belfast. The Presbyterian Historical Society also holds Presbyterian records for some parishes in the Republic of Ireland. There are also listings for other denominations, such as Methodist and Baptist, found in Steven Smyrl’s Dictionary of Dublin Dissent, a useful tool for figuring out where records for an obscure congregation might be found. Some Church of Ireland, Presbyterian and Methodist registers have been indexed on the various county heritage centre sites at www.rootsireland.ie but this is certainly not a comprehensive collection for these denominations. Before signing up and paying for an online collection it is worth using the guides at www.johngrenham.com, PRONI and the Representative Church Body Library to plan your search and determine the most likely place where the records you require have been indexed. There is no point paying for a Findmypast subscription if your ancestors were Presbyterians from Ulster, your money would be better spent on a researcher in PRONI. Don’t sign up to Rootsireland if your family were Roman Catholic and came from Kerry, these records are freely available online at www.irishgenealogy.ie. Parish registers, if they survive, are the source that will document your family prior to the start of civil registration in 1864. They can be challenging to navigate, but ultimately rewarding to see your ancestor’s name, in the poor hand of the parish priest, written 180 years ago. Nicola's next post in a few weeks time examines the surviving Irish census returns, where to find them online and tips for how to get the best out of the records.